We have gained expertise in the field of manufacturing and exporting of Brass Handbells. These handbells are available in wide spectrum of ranges such as Malmark Hand Bells, Brass Hand Bells, Kids Play Hand Bells, Handbell Mallets andMusical Bells. These handbells could be operated with hand and give awesome sound which would transport you into world of joy and ecstasy. Reckoned for manufacturing and exporting Handbell of amazing quality and long lasting nature, our company has set benchmark in the industry. These handbell mallets are developed and designed by the leading industry experts who consider the client’s requirements and needs perfectly. Obtainable in diverse and distinct ranges, these handbell mallets have glossy appearance, unmatched finishing and sparkle beauty. All this at nominal prices. With the support of our skilled and talented professionals, we manufacture and export Musical Bells. These musical bells are equipped with a ringer grasps and flexible handle. Coated with an antiresistant material, these bells are offered in numerous ranges and are highly reliable and versatile in nature. Further, these musical bells are efficient and undergo rigorous quality checking under various industry parameters before being dispatched for sale n the market. We have gained name and fame in the field of manufacturing and exporting of Kids Play Hand Bells. These hand bells are hot favorite among the kids and are perfect playing tools. Designed for longer usages, these hand bells are known to produce musical sounds. These hand bells are fully customizable and arte offered at reasonable prices. Our clients can choose from multiple configurations and ranges available with us. Our company is highly acclaimed in the domain of manufacturing, supplying and exporting of Brass Hand Bells. As its name suggests, these hand bells are fabricated by optimum quality of brass which is sourced from our genuine vendors. Consisting of ringer grasps, these hand bells are designed to be rung by hands. Besides, these produce mind blowing sound which would mesmerize you. We deliver it in timely manner to our dear clients. Our company has risen to prominence in the domain of manufacturing and exporting of Malmark Hand Bells. These hand bells could be operated by hands and produce wonderful sound which would simply captivate you and take you to heavenly world. 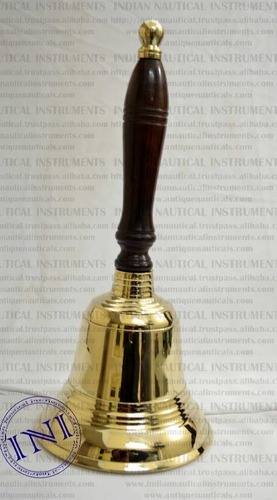 These hand bells are manufactured utilizing the advanced tools and technologies and undergo impeccable finishing. These hand bells are highly reliable and have shiny appearance. Sizes 4", 5", 6", 7"